This Persistence Market Research report examines the global electric bicycle motors market for the period 2017–2025. Electric bicycle motors, which can be hub type, mid-drive, and friction drive, are used for propulsion of bicycles with negligible human efforts, with mounted in the center of bicycle and connected to pedal sprocket. The North America bicycle market is driven by fitness-focused consumers. A large number of people in the North America region are unfit and overweight due to the unhealthy practices in their day-to-day diets. In order to overcome obesity and related health issues, consumers are showing an interest towards exercise and exercise equipment, such as bicycles. The North America region is actively responding to sustainable trends, namely exercise, healthy lifestyle, and sustainable transportation. The fifty most popular cities in the U.S. posses 8,600 miles of bicycle lanes altogether. Associations have become more operational supporters for cycle travelling. Moreover, the International Mountain Bike Association and several other groups are promoting various ways to use cycling as a performance-oriented mode of transport. Urban associations have formed societies and organizations in every zone, such as Transportation Alternatives in the New York City, to stimulate bicycling as a practice of daily exercise and transportation. This is anticipated to boost the demand for electric bicycles in the North American market in the coming years, which will promote the growth of the electric bicycle motors market in the region. As per the assessment of Persistence Market Research, the global electric bicycle motors market was estimated to be valued at nearly US$ 5,200 Mn in 2017 and is anticipated to touch a valuation of nearly US$ 8,500 Mn in 2025, exhibiting a CAGR of 6.3% during the period of assessment 2017-2025. Since the past two years, the oil industry has witnessed its lowest downturn since the 1990’s. The direct effect of this can be seen on the manufacturing sector in North America. Numerous companies of the U.S. are cutting their investments sharply. This has a direct effect on the confidence of investors for investing in the development of electric mobility vehicles in North America. Moreover, due to the fall in oil prices, several low priced models were discontinued as brands focused towards the diversification of their business. 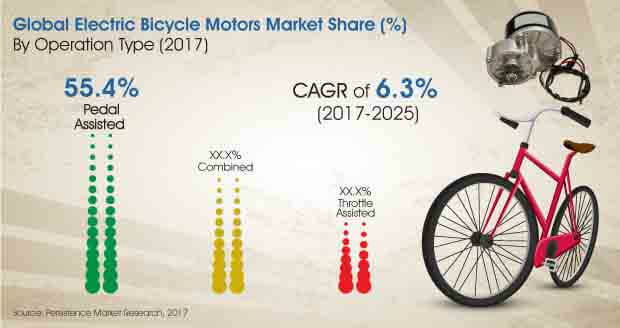 This is estimated to further derail the demand for electric bicycle motors, which may have a negative impact on the growth of electric bicycle market in the coming years. Rental and sharing services in big cities in North America is turning out to be a key trend. California and New York are getting more support from government authorities to use bicycles as an effective mode of transportation. With the increase in rental and the sharing services, the demand for maintenance and replacement services is anticipated to rise in the coming years. This will subsequently increase the demand for electric bicycle motors, which is anticipated to create opportunities for enhancing the growth of the electric bicycle motors market in the coming years. As per the forecasts provided by Persistence Market Research, the throttle assisted segment in the operation type category was estimated to be valued at nearly US$ 800 Mn in 2017 and is anticipated to reach a valuation of nearly US$ 1,200 Mn in 2025, displaying a CAGR of 5.3% during the period of forecast 2017-2025. The combined segment in the operation type category was estimated to be valued at nearly US$ 1,500 Mn in 2017 and is likely to reach a valuation of nearly US$ 2,700 Mn in 2025, exhibiting a CAGR of 7.4% during the period of assessment. Suzhou Xiongda Electric Machine Co., Ltd.